Recently I was given the opportunity to try out a shawl/pashmina from HairCoverings.com. I have never owned a shawl, so I wasn’t really expecting anything too glamorous. They changed my expectations. When I pulled the pashmina out of the package the first thing I noticed was how soft and silky it is. It feels so luxurious; I didn’t want to put it down. It’s very well made and the fringe doesn’t appear to be in danger of coming off. I’ve used it several times either as a shawl covering for a dress for more formal occasions, as a “jacket” over a tank top at more casual events, and also as a decorative scarf and every time it looked great and even got me some comments on how pretty and soft it was. I haven’t washed it yet, as I haven’t needed to and probably won’t for a while, but I would imagine it’s hand wash only. I don’t know how well it would hold up in a washer but I wouldn’t try. Plus, machine washing might ruin its silkiness. I will definitely be hitting up HairCoverings.com again in the near future for more pashminas and to try out some of their other products. They carry many beautiful items such as hair clips, headbands, fashion accessories, pony holders, banana clips and more. 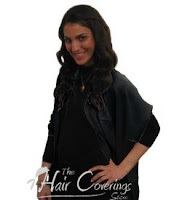 Thank you to HairCoverings.com for sending us a sample shawl free of charge to base this review upon. One lucky reader will receive a Surprise Box of Hair Accessories worth $25 from HairCoverings.com . Browse the hair accessories and other products available from HairCoverings.com . Then leave a comment telling me which item or items you would love to own. You MUST do this to be eligible to win this contest. 3) For 10 extra entries, blog about this contest linking back to this post AND HairCoverings.com . Then come back here and leave TEN separate comments with the link to your blog post. For 1 extra entry each, Friend me on Facebook and/or "Like" the 3 Garnets & 2 Sapphires Facebook page. Then leave a separate comment for each entry completed with the link to your Facebook profile. 5) For 1 extra entry each, follow HairCoverings on Twitter and/or "Like" HairCoverings on Facebook. Then leave a separate comment for each entry completed with the link to your Twitter or Facebook profile. This contest will be closed on Monday, June 21st, 2010 at 11:59pm EST. A random number drawing will be held shortly after. The winner will be announced here and will be contact via email or through their blog. If the winner does not respond within 48 hours, a new number will be drawn.